The USS OKLAHOMA CITY (CLG-5), a Galveston class guided missile cruiser, was commissioned on 22 DEC 1944 as CL-91. She battled the Japanese in 1945 and then served as part of the occupation force of Japan. The situation in the late 1940s no longer required "OK City" and she was placed in reserve in 1947. The late 1950s had USS OKLAHOMA CITY undergoing a extensive conversion to a guided missile cruiser. She was recommissioned as CLG-5 on 7 September 1960. 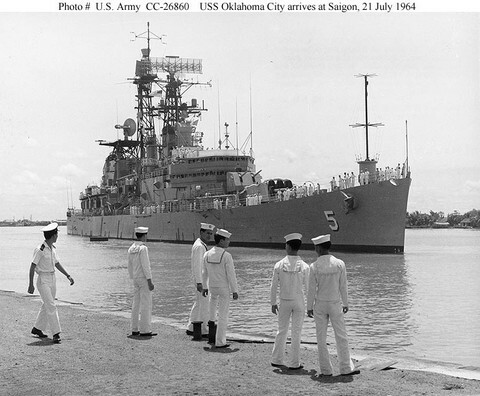 OKLAHOMA CITY began a series of Western Pacific deployment, first at peace, then at war, supporting the effort in Vietnam. With the war ending in 1974, continued to return to the Western Pacific periodically until decommissioned in 1979. OKLAHOMA CITY then spent twenty years in the Naval Inactive Ship Maintenance Facility in Suisun Bay, CA, until sunk in a Fleet exercise off of Guam in March 1999. USS OKLAHOMA CITY served her country, as CLG-5 for 19 years, 3 months and 8 days, until decommissioned on 15 DEC 1979. Following shakedown, Oklahoma City transited the Panama Canal and reported to ComCruPac for duty, arriving Pearl Harbor 2 May 1945. She conducted local operations until 22 May when she sailed for Ulithi, thence to rendezvous 6 June with Carrier Task Group 38.1 for operations in support of the Okinawa campaign. For the rest of June and into July she screened 3d Fleet carriers during their intensified air operations against Japanese forces. On 18 July she formed a bombardment group with other cruisers and destroyers, then rejoined the carrier task group for continued action against the Japanese home islands. At the end of hostilities she continued to patrol off the coast of Japan and it was not until 10 September, after seventy-two days of continuous steaming, that she finally entered Tokyo Bay. Oklahoma City remained on occupation duty until relieved 30 January 1946 when she departed for the United States. She arrived at San Francisco 14 February where she remained until 15 August when she entered the Marc Island Navy Yard for inactivation. She was placed out of commission in reserve 30 June 1947 assigned to the San Francisco Group, U.S. Pacific Reserve Fleet. During her shakedown training, Oklahoma City became the first combatant unit of the Pacific Fleet to fire a TALOS guided missile successfully. Following shakedown, she participated in several major training exercises while serving as flagship for CruDiv 3 and CruDesFlot 9, then departed 1 December for a six-month deployment in WestPac. She arrived in Yokosuka, Japan 20 December where six days later she became flagship for Commander, U.S. 7th Fleet. The ship participated in SEATO training operations, received two awards for operational excellence, and served as an ambassador of good will to several cities in the Far East. She then returned to Long Beach, California 12 June 1961 and spent the next several months conducting local training operations and upkeep work. On 14 December she entered the Long Beach Naval Shipyard for restricted availability followed by an extensive overhaul. In early 1964, Oklahoma City began refresher training in Southern California waters to prepare for a lengthy deployment, then departed for Yokosuka where she arrived 7 July to assume her duties again as 7th Fleet flagship. 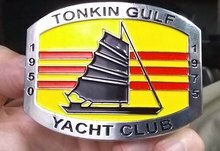 Shortly thereafter, North Vietnamese gunboats attacked U.S. destroyers in the Tonkin Gulf and Oklahoma City quickly began a 25-day alert in the Gulf. Training exercises and operational visits to various ports in the Far East followed, then in June 1965 she began gunfire support missions off Vietnam. When the level of hostilities increased, she began to spend more and more time in the South China Sea and eventually participated in operations Piranha, Double Eagle Deckhouse IV, and Hastings 11. After serving as 7th Fleet flagship for two and one-half years, Oklahoma City returned to San Francisco Bay Naval Shipyard 15 December 1966 for overhaul. Following her yard period, she began refresher training in the Southern California operating area in July, 1967, and continued those exercises and intermittent calls to West Coast ports until she deployed again to WestPac 7 November 1968. She arrived at Yokosuka 20 December and into August, 1969, was again contributing to the strength of the 7th Fleet by participating in the varied assignments its units are called on to perform.